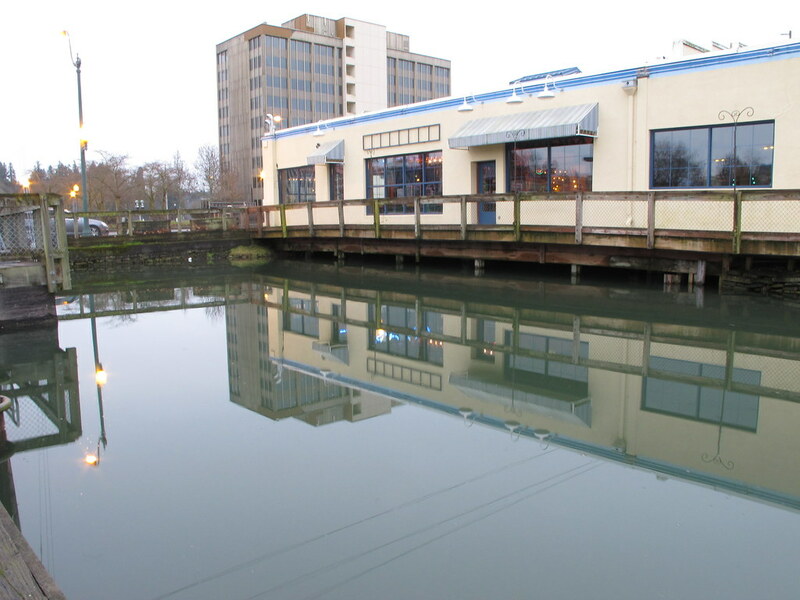 Olympia Time: Why does the Olympia Oyster House mean so much to us? Why does the Olympia Oyster House mean so much to us? The Oyster House will open back up tomorrow after more than a year closure because of a fire. After a false start of an announced opening near Lakefair weekend, the Oyster House posted up last week August 12. And, Olympia caught fire. I don't think it would be a stretch to expect a line out the door when they reopen. But, why does the Oyster House, seemingly more than any other restaurant (short of maybe the Spar) hold such a high place in Olympia? It certainly isn't the food. I'd agree with most that the food there is good, decent, but generally unexciting. I suppose that works because it remains accessible to most people. It is a pretty standard, fairly priced, Cascadian seafood place. But, certainly below the standard of the other shoreline seafood places even in Olympia. You have to admit, the Oyster House has a pretty nice location. Practically all the traffic crossing Olympia is funneled right in front of the Oyster House. And, no other business on that stretch (sorry green Vietnamese place) has the sense of the Oyster House looming over that corridor, sitting crisp and smartly on the southern edge of Puget Sound. Everyone who lives here passes by the Oyster House often enough to get it stuck in their head. Unlike a lot of place, the Oyster House has grown up with Olympia. Other places that compete with the Oyster House's stature in Olympia either stayed stale for too long (the Spar, only recently updating under new ownership, aren't that old (Darby's) or appeal to a broad enough group (Ben Moore's). The Oyster House has evolved, is widely acceptable and has a long history. A history so long, I'd say it is effectively been the restaraunt that grew up with Olympia. My unified field theory of Cascadian history holds that (come on now, stay with me) that we either turned a major corner or that our history really started in the 1940s. While the foundation of the region was set in the first 100 years, my theory is that we didn't really start building the house until World War II crossed off all the failed efforts in our start and stop history after statehood. Since the 1940s, our history (even locally here in Olympia) has been a straight shot in one general direction. We've left behind the resource extractive industries, and grew in at a regular pace into a generally professional, quasi-government and college town. And, the Oyster House has been there since our growth started. It left its own resource extractive history behind, switching fully from an oyster plant to a restaurant. Three since then, the restaurant was destroyed by fire. Each time, it came back, updating itself as it went along. The most recent update in the early 1990s, when the now ubiquitous floor to ceiling windows and clean floor plan were added, were reactions to the closure of the Oyster House that I remember as a kid. I only went in there only once or twice, mostly because it wasn't a place for families. Tall backed chairs, hardly any windows and dark. It seemed like a place where men and women would come together outside of a family setting and speak as men and women do. It was a cigarette era place and by the 1980s, that sort of place was not the centerpiece of our town. This was the Olympia that in the 80s had won the Olympia marathon trial, had build the Washington Center and shelved their old form of city government. Finally, the added benefit of Evergreen was growing shoots in town, and we'd moved past the Oyster House being a smokey dark gathering place. And, after this most recent fire, the Oyster House is coming back again. It looks like the same general layout is still being used, the large windows are still there as well. Which makes sense. I feel like Olympia is so much more of the family centered place that killed the old cigarette Oyster House in the 80s. I understand that the Oyster House isn't accessible to everyone. For a town that isn't very diverse, it is diverse enough in taste for people not to like the Oyster House in the same way they don't like Lakefair. In exactly the same way. But, Lakefair is crowded and so will the Oyster House tomorrow.